For a while I thought I’d start 2017 off with a TBR list or a WIP Wednesday (haven’t done one of those in forever). Something optimistic. Something about my productivity. But unfortunately, there hasn’t been any. And apparently I’m not the only one. For weeks I’ve been waking up at 5:30 to write before school but instead of writing, my thumb swipes the twitter icon on my phone and before I know it I’m drowning in one awful thing after another. I read an article the other day about how much productivity has slipped across all job sectors due to the chaotic state of our democracy, as well as the world. People are living in a fog–anxious, helpless, unable to concentrate on the future or the possibility of it containing anything good. Depending on the breaking news, some days the realization that I’m a teacher and the huge responsibility that comes along with that makes me feel even more helpless. On the one hand I am doing the most meaningful work I possibly could be right now. On the other, all of my students are immigrants and when they ask me if everything is going to be okay, if they are going to be okay, I don’t have an answer. I am just as worried and afraid as they are and I can’t imagine what it’s like to be a child in this world where even the adults you trust can’t offer you comfort. The stakes right now are sky high and in my tiny classroom in my middle-class neighborhood I feel the weight of the world. I want to teach my students how to save it. How to save themselves. Us. Because I know that they are the only ones who can. Unless we destroy everything before they even get a chance. Happy belated birthday to me! My birthday was almost a month and a half ago but reflections are better belated than never, which is why I’m finally sharing my grand list of all the things I’ve learned in the past year. It’s a “sort-of” tradition I started a few years ago and is my chance to look back on all of the mistakes learning opportunities that have resulted in me being not just another year older but another year wiser. 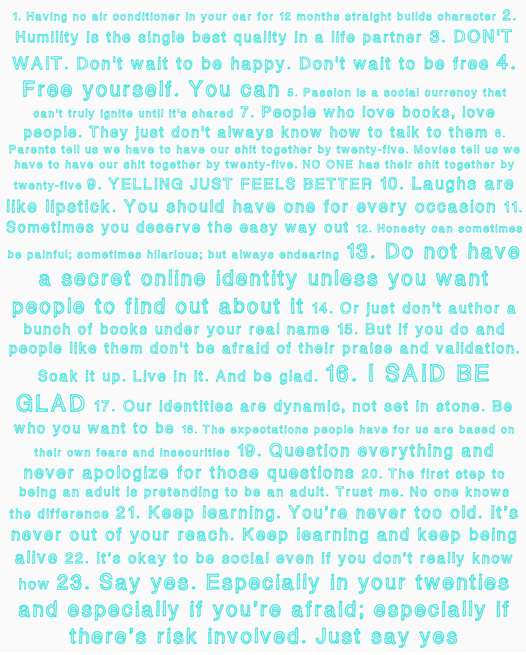 Here are my revelations from age 21, 22, and now, without further ado…23 the things I learned while being 23! This seems to be a disturbing trend of my twenties and even though those who are older and wiser have told me that being scared and confused is what your twenties is all about…I just can’t accept it. I need to be in control. I need my plans to pan out. I need to know myself and what I want. And I don’t. Not completely. For the past five years I’ve been driven by dreams and by my relentless fear of having an ordinary life. I thought school was the answer. I thought writing was the answer. I thought money was the answer. But none of those things have given me the kind of success or security I’d hoped for. And for a long time I decided to just wait it out, to work in another job that didn’t fulfill me spiritually and didn’t pay me what I deserved, and to just write as much as I possibly could until one day something stuck. But I’m six novels in and I’m still not earning enough to make writing my full-time career. And I’m tired of waiting. Maybe I’m not supposed to have all the answers in my twenties but that doesn’t mean I shouldn’t be proactive about finding them. My dream is to be a novelist but from now on I won’t allow that to be my only dream. I am smart and I am capable and I am ready for a new challenge. I’m ready for a new life. So, while I’ll still write every day, I’ve also decided to go back to school to get my master’s degree in education. I love books and there is so much more I can be doing in this world to contribute to the spread of literacy and love of reading. Great stories save and our young people need that now more than ever. They need righteous examples of faith and strong will. They need to be exposed to ideas that both inspire and challenge. They need to read. They need to write. To organize their thoughts and analyze their emotions and form opinions that can’t be easily swayed. Reading breeds empathy but writing breeds independence and teens in today’s world desperately need both. I’ve always tried to write with these things in mind and to approach each story as a means of making my readers feel connected and acknowledged but there is only so much I can do from behind my keyboard. Even with access to the internet the reach of my novels is still limited. If I really want to make a difference then I’m going to have to step outside my comfort zone and join the fight for literacy on the front lines. I’m not sure if I’ll be a great teacher, or even a good one, but I know I’ve got the passion to try. I know I’m meant to make a difference in the lives of young people, and whether that’s through my novels or through teaching, that’s exactly what I plan to do.